Here is a menu of traditional Scottish food for a celebration in the olden days. It would have been served on a special occasion a couple of centuries ago - making it appear to us quaint and old-fashioned (and with some parts of it possibly unattainable!) now. But it should give you some ideas if you are looking to create some elements of this type of Scottish menu - say, for a St Andrews Night Dinner. A record of traditional Scottish food was compiled by the wife of an Edinburgh publisher and appeared originally in 1826. Amongst many other recipes and food tales, 'The Cook and Housewife's Manual' also gives a complete bill of fare for a St Andrew's Night or Burns Night celebration or any other Scottish national dinner. I have reproduced it here with brief explanatory notes and a a general air of puzzlement and incredulity. The Scottish menu below follows a format that has a ‘remove’: according to my old Chambers’ Dictionary defined as ‘a dish to be changed while the rest remain’. The menu below is well worth a look for its flavours but follow this link for recipes for traditional Scottish dishes. The chicken part involves making a broth with veal and adding eggs just before serving. Sir Walter Scott ( in ‘The Fortunes of Nigel’ - and I ain’t planning on reading it any time soon) says it was a favourite of King James VI. Meanwhile, the soup is a meat-based long-simmered concoction with slivers of rump-steak added towards the end. What’s with this ‘brown’ word again? Potted game is probably self-explanatory while minced collops are an early version of today’s Scottish ‘mince’ – still an everyday element in traditional Scottish food. Except that it has an optional addition of oatmeal or barley among other flavourings. (Pictured here) Haggis in variety in a Scottish butcher shop. (Sometimes still called a flesher in Scots.) To me, it looks like several lesser haggises paying court to the King Haggis at the back. But maybe I’m reading too much into this. By the way, I don’t know anyone who makes their haggis at home…but see next picture. 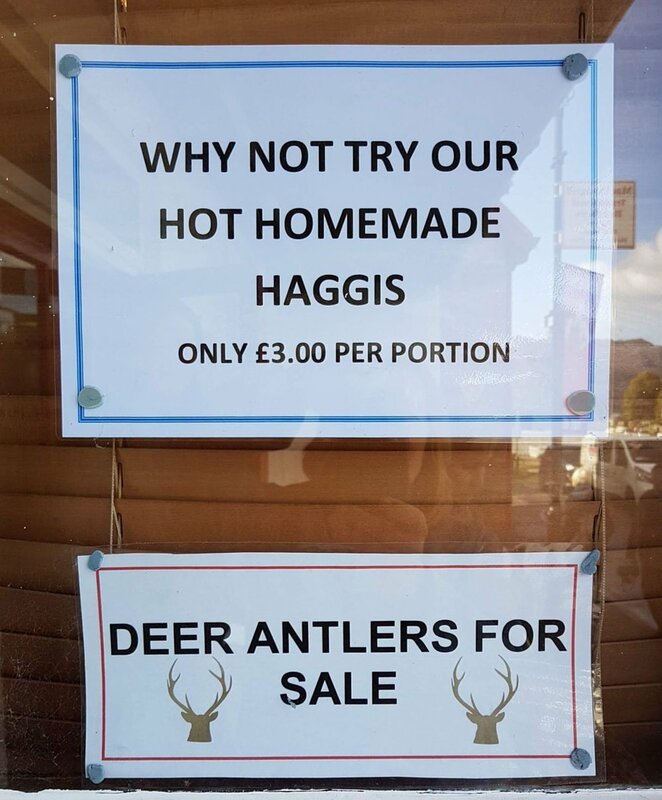 Here’s a shop in Fort Augustus making it easy for you to say ‘Well, I tried haggis once…’ The deer antlers are not for eating, obviously, but for hanging your hat on or sawing into chews for the dogs perhaps. – well, you’d have to have that somewhere, wouldn’t you? An icon of traditional Scottish food. – the salt cod is a once common way of preserving the fish, in Scotland and further afield, while the crimped skate was a fairly widespread recipe beyond Scotland too. In my home town, an east-coast fishing port, skate had a reputation as an aphrodisiac. My dad told me that. At least I think that was what he was saying….wait a minute, he’d never have said that. Must be thinking of someone else. Probably an old fisherman. I don’t know about you but this sounds ghastly. Wouldn’t blame you if you skipped this course. – solan goose was the name my father (again) used for the gannet – the northern gannet, morus bassanus. Nobody eats gannets now in Scotland, except for the men of Ness, at the tip of the Outer Hebrides in the west, who have special permission to take a certain number of fat chicks every season from the little rocky island of Sula Sgeir. Though the practice is vigorously defended by the local Gaels, the flavour of these ‘gugas’ is variously recorded but many descriptions seem to include the word ‘vile’. OK, an acquired taste (perhaps as in ‘eat up – it’s your heritage’). This is traditional Scottish food for extremists! – also called powsowdie. Best way to dissuade you from even thinking about this traditional Scottish food is to quote part of the recipe. ‘Choose a large, fat, young head. When carefully singed by the blacksmith, soak it and the singed trotters for a night….Take out the glassy part of the eyes….then split the head with a cleaver.‘ All right, that’s enough. – tups are sheep, so, no escape from the heads, then? Venison is widely available and popular – the roasting needs care as it is such a lean meat. – ‘drappit’ here is ‘dropped’, hence poached. Sorry about the head again, but at least it’s a small one this time. Scallops - just don't overcook 'em. Partans are edible crabs, one of the few words that came into Scots (I mean into the northern form of ‘English’ that we speak) from Gaelic. We’d certainly use the word at home. Seafood is a growing component in modern Scots cuisine and widely available – for example, scallops (pictured here), plus what we would have called ‘pra’ans (prawns) sometimes referred to as Norway lobster (Nephrops) or (if posh) langoustines. And lots more. I’m getting really hungry writing this. Aha! The puddings have arrived. This must be third course. The not exclusively Scottish posset is basically a curdled-milk pudding, using some acidic liquor to curdle. For once, almost self-explanatory – but plum-damas is prune. You have been warned. – just in case one of your guests leans back and says ‘that was lovely, but what I’d really like to finish off with is a ptarmigan‘. Odd to modern tastes, these game birds at the end. Blackcock or black grouse are not that common in Scotland these days – try upper Glen Lyon, that’s where I saw them last. Ptarmigan are our high-altitude grouse, much disturbed by hill-walkers and skiers, though tame by nature and thus easily hunted in the bad old days. And that’s it. Gosh, I’m very full now…I should never had that last ptarmigan. Scottish shortbread, a buttery biscuit or cookie, is iconic like haggis, and still a favourite in Scotland. This page features a couple of easy to bake traditional shortbread recipes including petticoat tails. Scottish high tea - the carbohydrate Olympics. First a big plate of meat pie, fish, chicken, then a knock-out blow - irresistible home-baked fancies. And all served late afternoon to early evening. It's not the same as afternoon tea in Scotland - a bit quaint, or even old-fashioned, a real substantial high tea is getting harder to find.